Andrey Arshavin in the match against Holland, June 21, 2008. 10 years ago the country was celebrating a huge victory over Holland, but it’s been a slippery slope for Team Russia since. What’s going to happen at the World Cup is anyone’s guess but the expectations are not high. 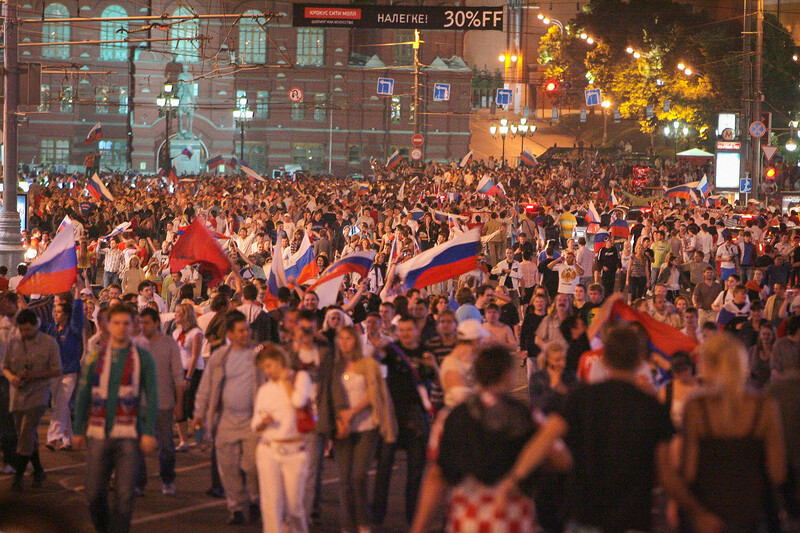 Moscow rarely sleeps – never more so on June 22, 2008 after the quarter-finals of the Euros in Austria and Switzerland, where Russia routed the Netherlands 3-1. Led by Dutch manager Guus Hiddink, Russia smashed Holland, who were favorites going into the tournament. And boy, did the Russians celebrate. The Red Square in Moscow after the play against Holland. Vasily Utkin, a Russian sports reporter, was left speechless (like many Russians) and wrote right after the game: “By now, at the Euros, no one plays football better than us. You can’t argue with that.” After three victories – against Greece (1:0), Sweden (2:0) and Netherlands (3:1), with the Russian team playing more bravely and beautifully in each game – it really was the case. How did Russia get there? Since the collapse of the USSR, Russia’s never been a favorite for any serious tournament. The country didn’t even qualify for the World Cup in 2006. After that, the national football federation hired the first foreign manager, Guus Hiddink, who previously coached the Netherlands, South Korea, and Australia. During Euro 2008 qualification, Russia only just scraped through, beating England but then losing to Israel: Only Croatia’s victory over England led Russia to the final stages of the Euros. In Group D, Russia started with a heavy defeat – 4:1 against Spain – but then showed real guts, beating three teams in a row. Roman Pavlyuchenko scoring in the match against England (2:1). This victory led Russia to the Euro, leaving the English team behind. Happiness never lasts long – especially if you’re a football fan in Russia. In the semi-final the national team lost to Spain again, this time 3:0, and went home. Nevertheless, for an underdog such as Russia, winning bronze, was a major success – even a film about the tournament was named The Golden Bronze. So how did Russia manage it? As Stanislav Minin, a sports reporter for Match TV, tells us, “there was a combination of factors that led to success – it’s impossible to single out just one”. Here are the main three. Experts point out that the National Football Academy fund founded in 2004 and sponsored by Russian businessman Roman Abramovich, contributed to the progress of Russian football. The fund was reported to spend around $150 – 200 million on infrastructural development, building 140 new football fields and hiring Guus Hiddink. Roman Abramovich. 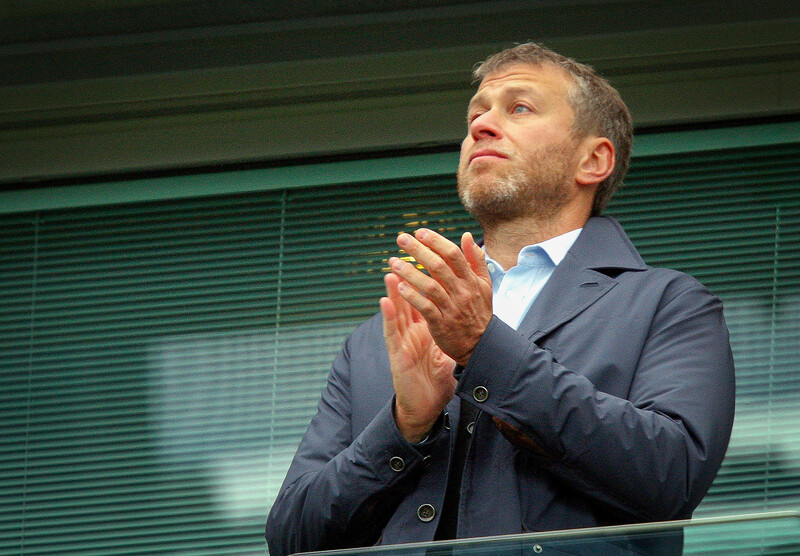 The owner of 'Chelsea' contributed in the success of Russian football as well. Andrey Arshavin, who scored twice in three matches and earned a place on the team of the tournament, is still considered one of the greatest Russian players in history. He, Roman Pavlyuchenko (three goals) and several other stars of Euro 2008 were snapped up by English Premier League teams after the tournament. After the game against the Netherlands, Hiddink became a national hero in Russia. President Dmitry Medvedev joked that he could have granted the Dutch manager citizenship, several babies were named Guus (not a typical Russian name), and the coach was nicknamed “The Wizard.”. 'The Wizard' Guus is giving one of his players a (magic) kick. Many believe that's what he did to all the Russian football. The match against Holland was a moment of pure euphoria. Unfortunately, then things became worse. Many fans thought Russia’s success at Euro 2008 would herald in a new era, but this wasn’t the case. Hiddink’s team didn’t qualify for the 2010 World Cup in South Africa, losing to modest Slovenia in second round play-off. After that defeat “The Wizard” left Russia and things went downhill. The national team went back to trying different managers, both superstar foreigners and prodigies from the Motherland – but to no avail. It’s been 10 years and now Russia faces another tournament. The expectations are not very high – after all, the last game Russia won was back in October 2017 – but as all football fans know, this game is great at surprising people. Here we have an article on why the Russian football is not, to put it mildly, on top of its game today. When did the Russian national team suffer the hardest defeat in its history?